Assistant and wife to trainer Tom Morley, Maggie is the hardest worker in our stable and plays a vital role in our operation. In the mornings, you can catch Maggie assisting around the barn or galloping our horses on the track. In the afternoons, catch her at the races as a paddock analyst for the New York Racing Association (NYRA). Maggie has been a successful licensed trainer and is highly regarded as one of the top analysts in the sport of horse racing. 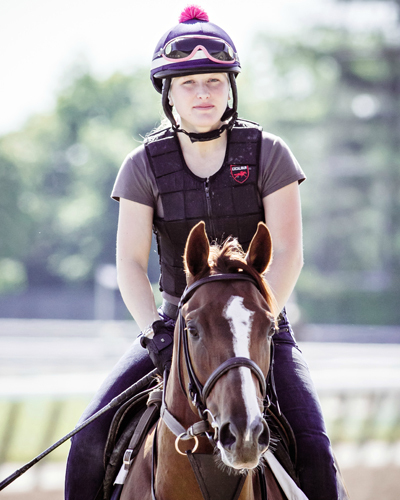 She’s a Maryland-bred and third generation horsewoman: Her grandparents trained racehorses and show horses; her father, Howard Wolfendale, is a multiple stakes winning trainer in Maryland, and mother Tammy grew up galloping horses. Now an elite horsewoman, Maggie has dedicated her life to developing and assessing equine athletes. If she’s not working at the track, she’s likely practicing dressage on the back of her OTTB, Stan.